Formula 1 decided to fix wasn’t broken by introducing a new elimination based qualifying format for the 2016 Formula 1 Season. Result? Chaos, outbursts, angst and more than a million impressions of negative PR on social media! The powers that control the sport decided to go ahead with the system despite facing flak from the always-ignored fans, drivers, teams, etc. – basically everyone who in the last few years seemed to have make more sense than the multiple ‘Working Groups’ created to fix the sport. I must admit, I hoped for some excitement and surprise as I tuned in to the broadcast of the qualifying session of the 2016 Australian Grand Prix. But like with most other rules changes in Formula 1, it was only minutes into the first competitive session of the season that I realized that the new format was an utter disaster. As the cars scampered around the Albert Park circuit, it was clear that neither the teams, drivers, Formula One Management (FOM) or the fans were able to comprehend the quick adaptation required by the elimination based qualifying format in the first few minutes. That the Channel 4 commentators were all over the place and FOM delayed the ‘countdown timer’ graphic only made matters worse. I wonder why fans are expressing surprise though. By now, we should be aware that Formula 1 is used to making rule changes that do more harm to the sport and cause #facepalm moments than help improve the show. There’s a universal call to bring back the old qualifying format for Bahrain. Will Formula 1 admit to making a mistake and make such a quick u-turn? I highly doubt that. But the sport is used to making and handling global PR disasters on a regular basis. Either that, or they just don’t care. The new qualifying format appears to work in theory. It relies on the fact that the fear of elimination will force drivers to be on track clocking faster times. At the moment, drivers are happy to sit in the garage or crawl around the track as their elimination period nears. It also relies on the entire grid being far closer in terms of lap time than they currently are. This is possible only in a utopian world of Formula 1. Or, they should just give everyone Mercedes engines! And lastly, this format needs qualifying spec tyres – ones that can offer sufficient bite to put in a series of fast laps and not just ‘a’ fast lap. From a tyre point of view, there are two realities that work against this format. First, the existing Pirelli tyres (softs, ultra softs, etc.) don’t go as long as this format would want the drivers to. Second, even if a driver has an extra set of tyres to go quicker, he might not always have the time to make a quick pit-stop and go out again. Traditionally, Formula 1 qualifying has always been about the faster drivers, cars and their laps and battle for supremacy. This format, offered anything but that (at least today). While Q1 and Q2 did feel spiced up, the focus shifted from the faster cars to the slower ones who were avoiding elimination. It is now about focusing on the driver who is trying to not be the slowest! Q3 on the other hand was an anti-climax as drivers settled for their grid spots rather than battle for it. The last minute pole clinching battles between Rosberg and Hamilton are few of my better memories from 2015. But this format might seldom offer a last minute dash for pole. While it is easy to criticize today’s session, it would be interesting to compare its results to the one that the old format would offer. Would Ferrari have challenged Mercedes in Q3 anyway? I doubt! But the drivers eliminated at the end of Q1 and Q2 would’ve possibly had much more time to re-attempt their laps. While one could argue this case, the debate at the moment tilts more towards the older format. If Formula 1 cars are THE biggest assets of the sport, this format works on a model that packs off the assets as early as possible than trying to leave them out on track to battle for as long as they can. I wonder if this makes any business sense at all. But again, this is the business of Formula 1 – creating chatter around the rules of the sport than the sport itself. This format saw a manifold increase in the confusion around the sport and a considerable drop in the excitement that qualifying typically offers. The only ones who should be happiest with this format are the minnows – they are guaranteed television coverage, just like those single-lap qualifying days. In a typical corporate company, a team that would’ve launched a product that failed instantly would’ve been sacked as instantly too. But this is Formula 1, oh well! Haas not being last! Hurray! Mclaren-Honda showing more promise. Can they fight for points tomorrow? Finally, 50 pole positions for Lewis Hamilton! Kudos! And his pole lap today was 2.5 seconds faster than last year’s. Will 2017 make the cars go even quicker? Here’s the pre-Australian Grand Prix episode of the Inside Line F1 Podcast – ‘F1, Back To Business?‘ and it seems we got most of our predictions right already – about the sport and the criticism it would attract. To make the current format work you need to have a tire which goes FASTER every lap, so everyone NEEDS (not wants…) to stay out all the time. 1) Easy : Ban tire warmers, they will start with cold tires that will need 2-3 laps to warm and then the fast laps will come, lots of show when the tires are cold because of no grip and then the fight will begin. 2) Hard : Pirelli has to make a tire which goes faster every lap, put hard rubber on the outside layer and softer on the inside, put back some grooves which gives bad grip until they are smooth (2005), whatever but this is possible. Solution 1 is probably better (and easier) because it will also make some nice moments when the tires are cold….think of it as if EVERY qualifying session was on a drying track, each lap it goes faster…. Thanks Jean-Charles for your comment. It is always fun to hear from my readers / listeners. I agree with your view that the now-scrapped qualifying format couldn’t have been supported by F1 from a technical point of view – tyres, even more so. Second being fuel, although with laps to come, fuel loads would decrease, but like you pointed out, the tyres would be way past their prime. The solutions you’ve offered make sense, just that starting on cold tyres is seen as a safety hazard by a few in the paddock. However, I am glad that we’re reverting to the old format from Bahrain. 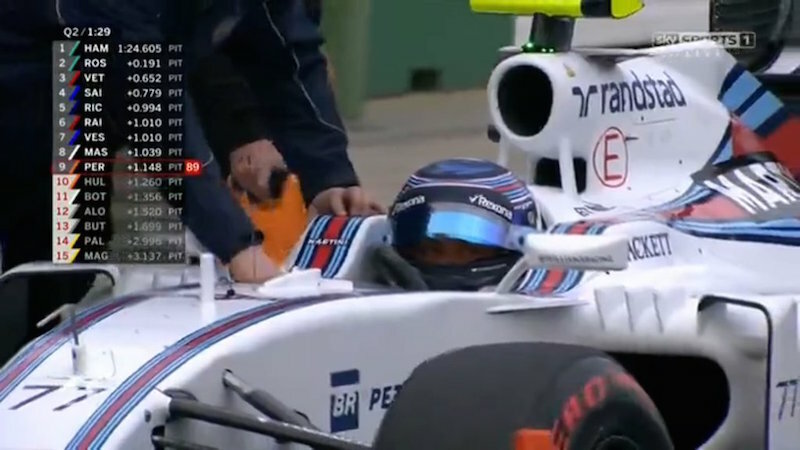 Previous article Previous post: Australian Grand Prix: Who’s Going to Claim the First Victory?